Ah, 1st post of 2010. I guess it took quite a while eh. After a very rushing trip to Singapore on 30th and coming back on 31st, I went to Melaka for 2 days after that. Well, it may not be the wisest choice to got here during the long weekend but I guess the company was good. Just like churros, it’s almost impossible to eat them alone without any sauce or creams. How has 2009 been for me? I would say its been quite a roller coaster ride. Nothing has been going on too well even though it seems like it has been. But oh well, it’s the past now and let’s just look forward for a better 2010. I saw these churros on Seasaltwithfood one day and decided to make it. Well, just so I can dip them in the left over dulce de leche I had. Put the water in a pan with the oil, lemon rind and bring it to a boil. Remove the lemon rind. Add salt to the flour, then add it to the pan all at once and beat vigorously with a wooden spoon, working it over a low heat for 1-2 minutes until it forms a ball. The mixture will be very stiff. Put it in a piping bag. Heat the oil to 185?C (365?F) (when a piece of dough is dropped in it should brown in 60 seconds). 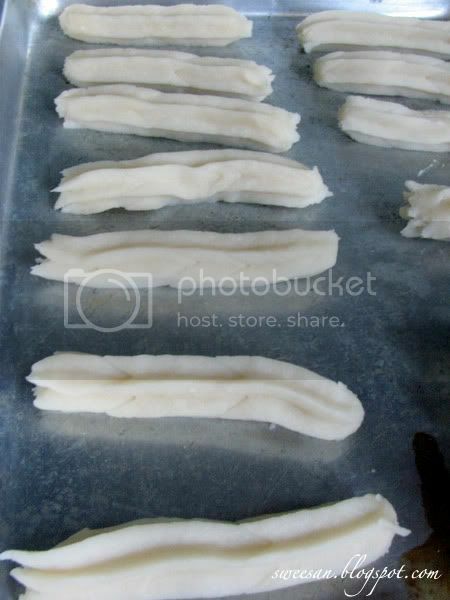 Force out long strips or rings of the batter into the hot oil, a few at a time. Fry for a few minutes until golden brown, then remove from the oil and drain. 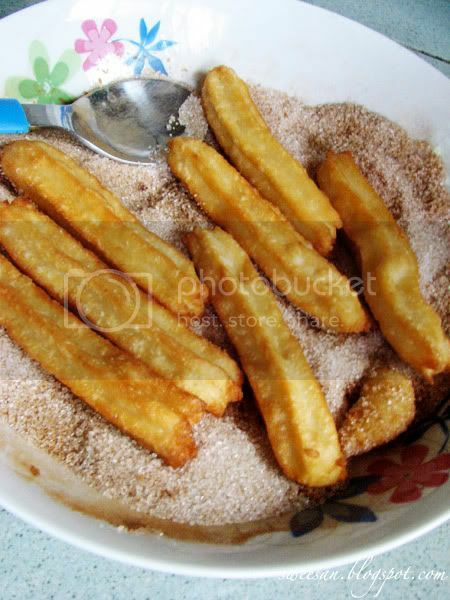 Sprinkle generously with sugar and cinnamon, if desired. I had quite a tough time piping out the churros. So after a few strands, I got lazy and just rolled them into logs instead and cut thorns like pineapple tarts. One advice, remember to cut thorns with a scissors before frying them otherwise the colour wouldn’t be nice and it will ….. burst! Anyway, I had quite some left over ingredients at home, such as avocado and dulce de leche. So, first up for the savoury types, I prepared an easy guacamole. 1. Cut avocado in half, remove seed and scoop out flesh into a bowl. Mesh with fork. 3. Add in salt and pepper to taste. If you have chili, deseed them and cut them very tiny and add into the avocado. 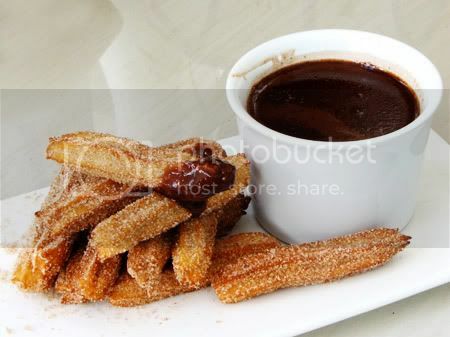 As u can see these churros don’t really look like the usual churros. When one is lazy, weird ideas come out hahaha. 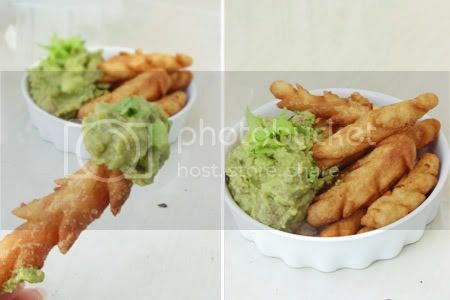 Oh, if you are serving them with avocado, don’t dip them in cinnamon sugar before serving. Melt soy milk and chocolate over double boiler. Stir constantly till everything has melted. Serve hot. 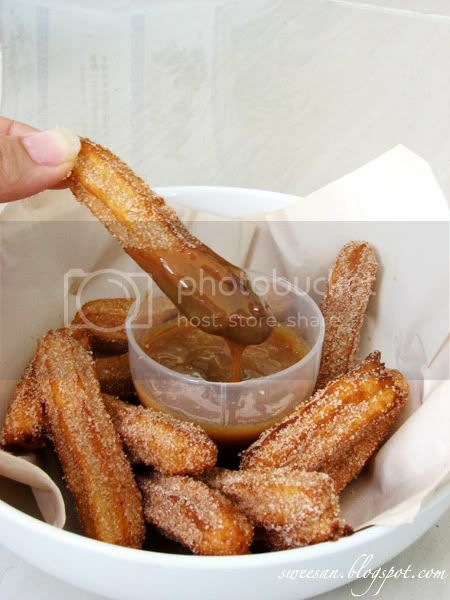 As I was happily eating them I kinda forgot that the whole idea of churros was to dip them into dulce de leche and USE THEM UP!! So I stopped those eating and went to pour some dulce de leche. Well there isn’t any recipe to make dulce de leche. You can get them in store or boil a can of condensed milk (unopened) for 3-4 hours and tada, you have it! Just that easy! In the end, I didn’t have enough churros for these sauces lol! 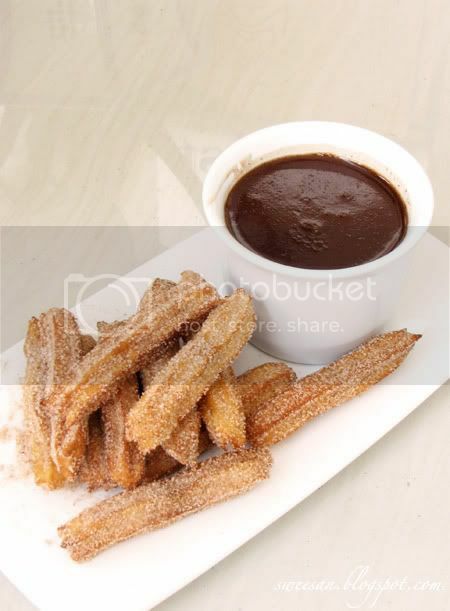 I just saw your churros recipe and would like to try. Just wondering though, how much oil do you use? When you fry them, does the oil cover everything?